The former PM says we need to offer more support to governments across the Middle East. "We can chew gum and walk." Kevin Rudd has warned that terrorist acts such as Tuesday's Berlin attack will continue as long as we only address "the symptoms of terrorism". His comments come in response to the recent attack in Berlin and the assassination of the Russian ambassador to Turkey. "Most of us in the collective west and elsewhere are dealing with the symptoms of terrorism," he said. However, he also noted that the fundamental causes of terror "lie largely beyond our control". The former Prime Minister is currently heading up the U.S. thinktank, the Asia Society Policy Institute, in New York and spoke to Sales via video link on 7:30 Report on Wednesday evening. So what are these underlying drivers of radicalisation? 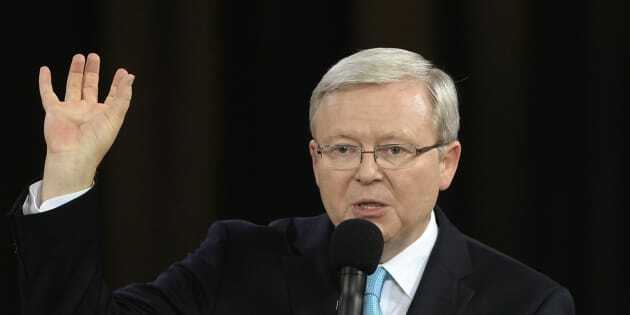 Accordding to Rudd, it's the theological war occurring within Islam and stagnated economic growth and youth unemployment across much of the Middle East. In terms of what actions we can take, Rudd is advocating a conciliatory approach. "We need to support governments and regimes across the Middle East and, beyond that, have significant Muslim populations to have a strong stable security relationship with them and maximise their ability to deal with, frankly, what are very significant religious insurgencies within their countries. "The total focus of our development policy [...] should be on the development of economies and jobs across these most fragile economies. And countries like us, Australia, we must have seamless intelligence relationships with countries across the world, in particular with Indonesia, given we will see the return of so many foreign fighters before too much longer from Syria and Iraq." The Mandarin-speaking former PM also warned against Australia being drawn into "the dumb binary game" between China and the United States, in light of current tensions between Donald Trump and the Asian powerhouse. "We can chew gum and walk, and we should," he told Sales. "We should under no circumstances repeat the hideous mistake made under Howard by simply being a cheer squad for what was then the Bush administration's determination to invade Iraq. "If we see a repeat of that in any form, either within the Asian hemisphere or broadly, our responsibility as an ally is [...] to say, our friends in Washington, you cannot and must not do this."